(Crossway Books, 2006), hb., 440 pp. 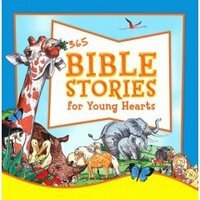 This is a nicely illustrated story Bible designed to cover the Bible in one year. Breaking it up into 365 stories is a helpful device for families. My wife has been using this book for our 4 year old when she has Bile reading time with the older boys. Our 4 year old can follow along to some extent. The illustrations are nicely done. Many of them also appear in the ESV Children’s Bible. Alan Parry is one of our favorite illustrators. As with most story Bible’s most attention is given to the narrative portions of the Bible. It is just more difficult to handle the letters in a story Bible. Still 4 stories are given to Paul’s letters, one to Hebrews and one to Revelation. This is a good story Bile for use with younger children and the set up can be helpful for families in establishing a regular Bible time with younger children. One of the most stunning, unique and captivating books on the account of the Ark and the global Flood of Noah's day ever produced. Based on the account recorded in Genesis 6-9 in the Bible, the narrative is true to the biblical record and its timeline of events conccerning Noah's flood, with added insight as to what it might have been like to be in Noah's shoes. Whether someone is an adult or a child, one quickly begins to feel as if they were there experiencing what Noah and his family went through. The artwork is so spectacular, one can almost sense the atmosphere, the anguish, the excitement and anxiety. Once inside the Ark, a feeling of awe creeps over the reader as the enormity and reality of this structure appears to grip one's senses. This is not just a fantastic reading book for the whole family, but a coffee table witnessing book and a wonderful gift idea for non-Christians to challenge them concerning the truth of the Bible and gospel. Any pictures of "Jesus"? I know that doesn't bother everyone, but it does our family. If you want to adveritse you may tell us of your site and provide a link. Please do not simply put one fo your posts in a comment. In the future I will simply delte such a comment. Great question, and one I should have thougth to address. Yes, it does have pictures of Jesus.